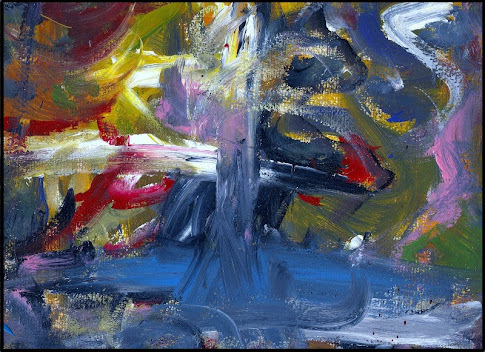 This is another favorite of mine-and I think the description Mone' gives is a good as it gets; so here, in her own words, is the illustrative version as well as the names of the colors used in the creation of this piece...Enjoy!! 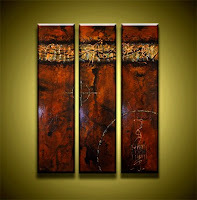 "This HUGE triptych painting has been beautifully distressed and washed with countless layers of earthy 'woodsy' hues contrasted with a cool palette of blue gem and Turquoise accents. The surface has been richly textured...GORGEOUS...perfect for a huge wall that needs a STUNNING centerpiece!" "Prominent colors include Red Brown, Deep Umber, Buff, Turquoise, Teal, Rust, Red Sienna, Goldens, and hints of Blue.. Delicately embellished with Goldened Copper acrylic accents. UV varnish protectant applied for an ultra high gloss shine. Signed on front. Sides painted Black for a clean, frameless presentation. Shipped wired and ready to hang. Stretched on heavy duty professional wooden support frames. Includes signed Certificate of Authenticity."